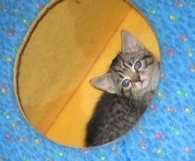 Tigris was found in an empty cottage by a kind hearted woman who brought her to me. She was the first kitten I've met with lice, and the first to run around sporting her new punk haircut! After she was done plotting my demise, she warmed up and began trying to take over the world with cuteness. She plays fetch with foam balls, and likes to sleep on your chest at night.